Complex left adrenal mass with capsular expansion and undifferentiated heterogenous architecture. Caudal vena cava invasion by left adrenal tumor and or thrombus. CVC mass +/- attached thrombus. 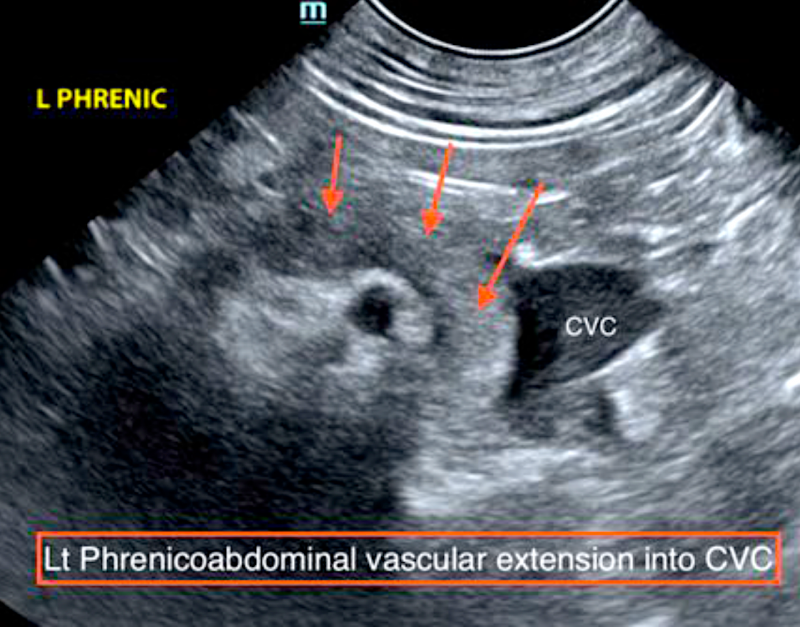 Left phrenicoabdominal vascular extension into the CVC. Wait! Imaging adrenal pathology doesn’t end with just finding the mass. It’s essential to fully interrogate the associated structures for further pathology. Is there phrenic vessel invasion and caudal vena cava invasion? Are the renal veins evident? Full Doppler imaging? Is the specialist able to measure the vessels accurately for potential surgical planning information? Heidi Putnam, SDEP™ technician clinical sonographer for Animal Sounds North West, did all of this and more as demonstrated superbly in the complete imaging in this case. Kudos to the pet owners for being compliant in the recommendation for annual exams. Many thanks to Dr. Meri Brandt and Dr. Jon Duncan of Willakenzie Animal Clinic in the management of this patient and to Amy Roth Jones, DVM, DACVR for her detailed interpretation of this case. A 9-year-old, MN, Heeler mixed breed canine was presented for his routine annual visit. Upon physical examination a 1.5cm firm subcutaneous mass was discovered on his ventral neck. FNA was performed resulting in blood. CBC/Chem was normal and the patient underwent surgical removal of the mass. 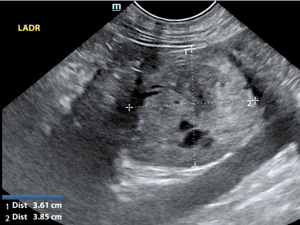 An abdominal ultrasound was performed to screen for any signs of metastasis in the abdomen. The right adrenal gland is normal in size and shape measuring 3.0 cm in length and 0.6 cm in diameter at the caudal pole and 1.3 cm in the cranial pole (increased dimension secondary to positioning). 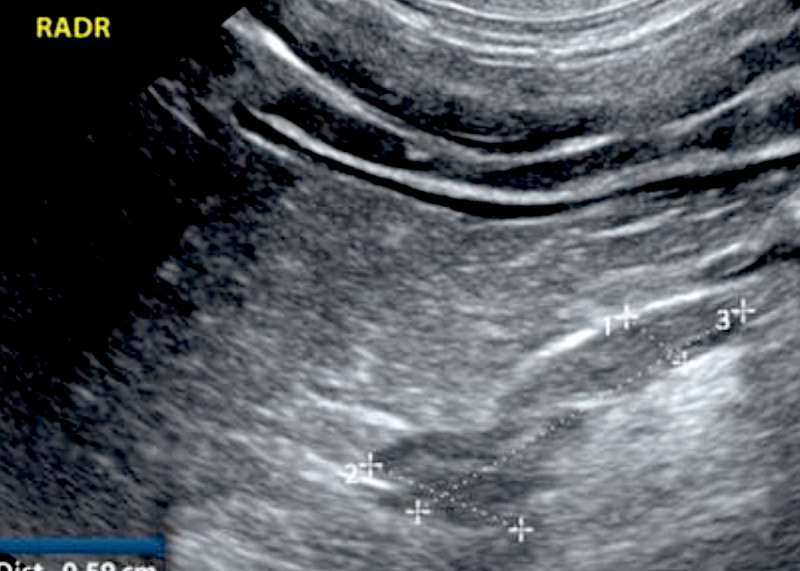 The gland is uniformly homogenous and normal echoic. The left adrenal gland is comprised of a well demarcated and well encapsulated, round soft tissue mass of uniformly heterogenous echogenicity with multiple, small, anechoic cystic structures. It measures 3.6 x 3.8 cm. Color flow Doppler reveals increased vascularity through the entire mass. 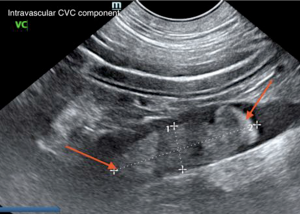 Several high quality clips of the region document a well-defined, irregularly marginated tubular soft tissue structure of similar, heterogenous echogenicity as the left adrenal mass filling the left phrenic abdominal vein and entering the caudal vena cava. Within the vena cava the structure is free floating and not attached to the wall. 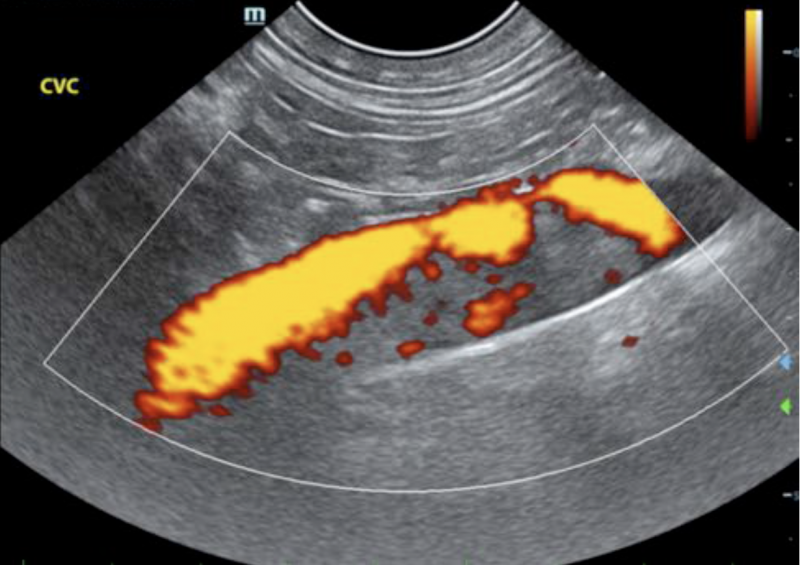 Color flow Doppler demonstrates blood flow completely around the structure, which measures approximately 5.0 cm in length within the caudal vena cava and terminates just caudal to entrance into the liver. The dimensions of this intravascular caudal vena caval structure are 5.0 cm in length x 1.2 cm in diameter. However, the dimension of the insertion of the phrenic abdominal vein measures only 5.8 mm. The renal vein is well visualized caudal and peripheral to the mass with no evidence of renal vein invasion. Left adrenal mass with vascular invasion of the phrenicoabdominal and caudal vena cava. Remaining normal abdominal organs with no evidence of hepatic, splenic or right auricular metastatic disease. 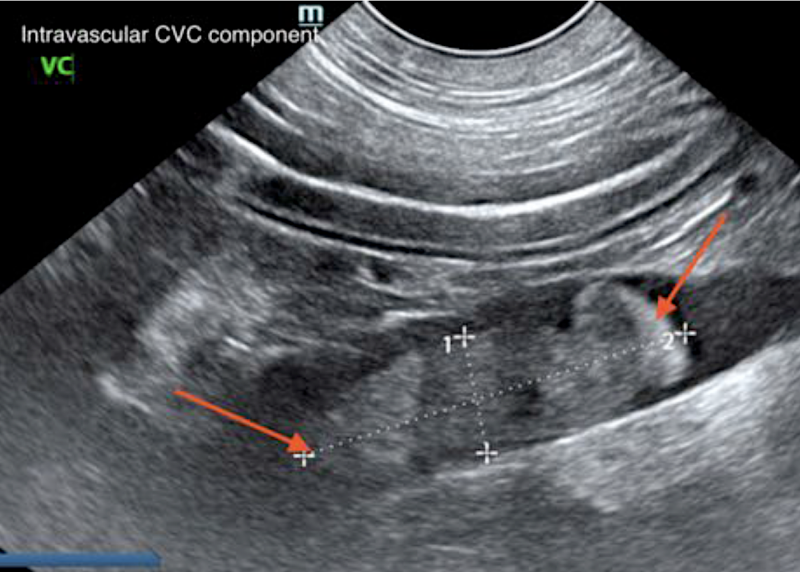 Further interpretation and recommendations from Dr. Roth were as follows: "Concurrent thrombus formation, especially regarding the CVC component, is also possible. This adrenal neoplasm is likely unrelated to the cutaneous hemangiosarcoma with primary differentials including a different neoplasm such as pheochromocytoma, which is more likely with vascular invasion, or adenocarcinoma. If aggressive treatment is elected there is some chance that the mass and associated vascular component could be surgically removed given the well encapsulated nature and the non-adherent characteristic of the intravascular component. However, excision would not be without risk for hemorrhage or vascular tearing and there is some concern for extracting the caudal vena cava component through the reduced diameter orifice of the phrenicoabdominal vein with the diameter being half the width of the measured mass diameter of the caudal vena cava component. Consultation with an experienced, board-certified surgeon is recommended. Concurrent consultation with a veterinary oncologist could also be considered for optimal treatment approach given the presence of the already documented cutaneous hemangiosarcoma. Lastly thoracic radiographs should be acquired if not already performed to evaluate for pulmonary metastatic disease. If surgical resection is considered CT may provide some additional surgical planning information. However, given the quality of this ultrasound exam I suspect minimal significant additional information would be obtained thereby directing resources for treatment rather than additional diagnostics." The patient did not go on to have surgery, but is getting treated with chemotherapy at a referral clinic and doing well. Want to learn to recognize and image completely like this, or refine your imaging a bit to take it over the top? Register for our 3-day SDEP™ Abdomen lab May 17-19, 2019. Left adrenal gland mass with color Doppler. Left adrenal with phrenic vein showing invasion of the mass.